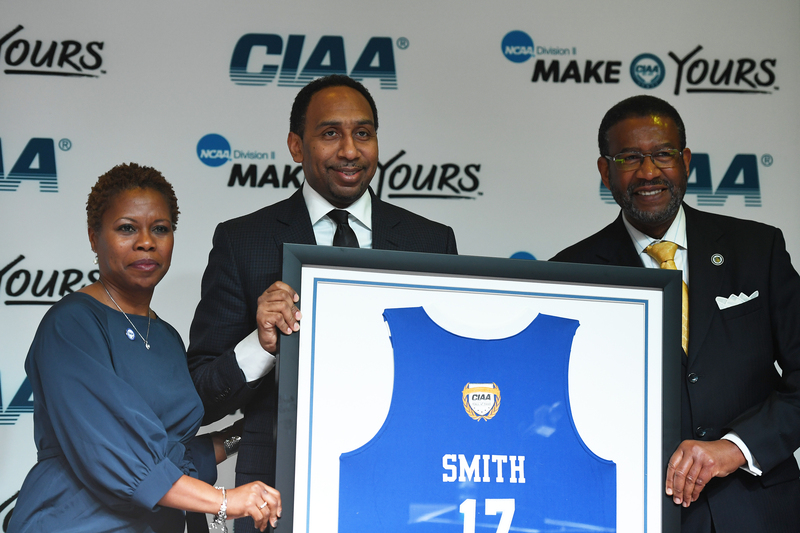 ESPN sportscaster Stephen A. Smith was inducted into the Central Intercollegiate Athletic Association (CIAA) Hall of Fame on Friday. But Smith’s entry was not based on the number of points he scored as a member of the Winston-Salem State University Rams basketball team. He gained entry, along with six others, for representing the ultimate ideal of a student at a historically black college or university (HBCU), who often does the most with the least, and who comes out of nowhere to achieve unimagined heights. One of the most recognizable faces in sports broadcasting, Smith was recruited to Winston-Salem State out of Hollis, Queens, New York, by Naismith Memorial Basketball Hall of Fame coach Clarence “Big House” Gaines. 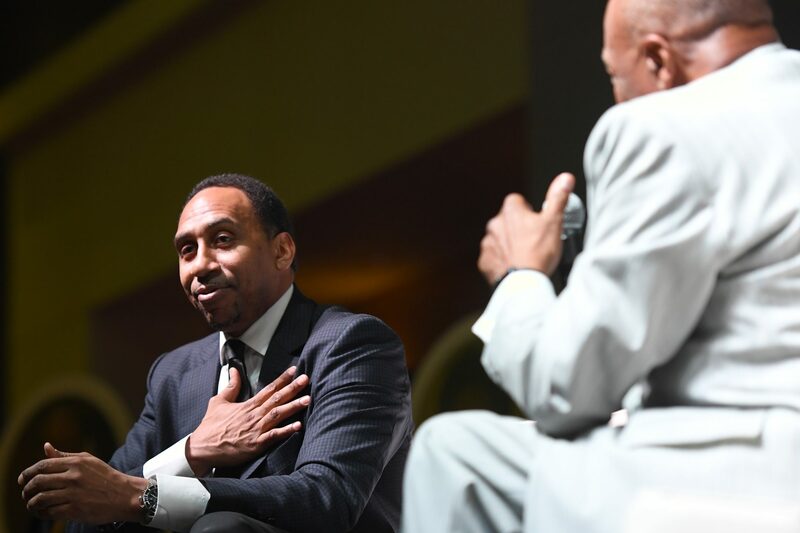 Stephen Smith talks with Charlie Neal during the CIAA Hall of Fame presentation on February 24, 2017 at the Charlotte Convention Center in Charlotte, North Carolina. Smith told a breakfast audience of nearly 300 that his career as a Ram was cut short by chronic tendonitis and a cracked kneecap he suffered shortly after arriving on campus. Despite not being able to perform on the court, Smith’s association with Gaines became one of the most important relationships in his life, one that endured until Gaines’ death in 2005. Smith corrected host Charlie Neal, who said Smith and Gaines became friends. Smith’s tell-it-like-it-is style began at Winston-Salem State when he was a reporter for the student newspaper, The News Argus. His first big splash at the newspaper came after he called for Gaines to step down. Smith told Gaines that if he didn’t retire he would write an article suggesting that Gaines should step down. Gaines cursed Smith and kicked him out of the office. Yet, amid the subsequent firestorm, with some faculty members and even the school’s chancellor calling for Smith to be expelled from the school, Gaines defended Smith. “Coach Gaines said ‘Leave him alone,’ ” Smith recalled. Stephen Smith holds up a framed Hall of Fame jersey during the CIAA Hall of Fame presentation on February 24, 2017 at the Charlotte Convention Center in Charlotte, North Carolina. Smith went on to write for the Winston-Salem Journal, the Greensboro News & Record, the New York Daily News and the Philadelphia Inquirer. Smith would go on to have his own radio and television shows, most popularly on ESPN, where he co-hosts First Take. Smith said the source of his confidence was the nurturing he received at Winston-Salem State from Gaines, an iconic basketball coach for whom he never really played.